Richard William Masson, 68, a retired Air Force colonel whose 30-year career included combat missions during the Vietnam War and senior policy positions at the Pentagon and State Department, died of lung cancer September 4, 2000 at Washington Hospital Center. 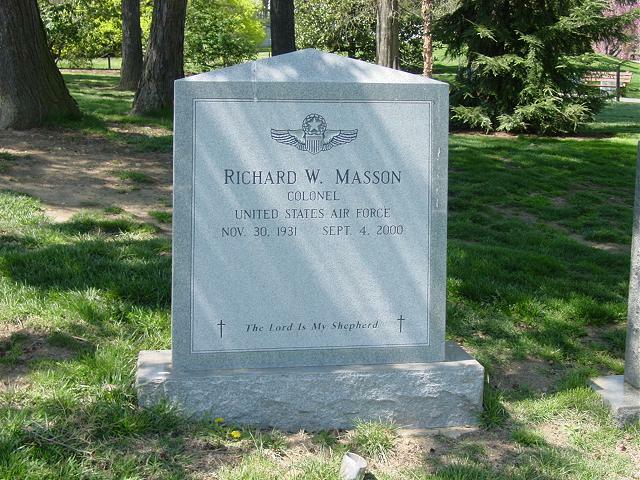 Colonel Masson, who was a native of New York, graduated from the U.S. Military Academy at West Point in 1955. He also graduated from the Naval War College and received a master's degree in international relations from Baylor University. He taught political science at the U.S. Air Force Academy in Colorado Springs for six years before being shipped to Southeast Asia in 1967. He served as a C-130 aircraft instructor pilot and as chief airlift controller with the 314th Tactical Airlift Wing in Taiwan. Among his war exploits was flying C-130 combat support missions to Marines shelled and surrounded by North Vietnamese troops at Khe Sanh near the demilitarized zone following the Tet offensive in 1968. Later, in Washington during an assignment with the State Department's bureau of political-military affairs, he chaired two U.S.-Greek committees that negotiated continued U.S. military operating rights at installations in Greece. issues at Air Force headquarters, executive officer to the Air Force deputy chief of staff for operations and plans, and division chief for Soviet military capabilities at the Defense Intelligence Agency's directorate of estimates. Florida-based Lake Aircraft Corp. His military decorations included the Legion of Merit. He was a member of the Army Navy Country Club and an avid tennis player. Survivors include his wife of 45 years, Greta Masson of Arlington; two children, Lisa Masson of Annapolis and Richard W. Masson Jr. of Fairfax; a sister; and two grandsons. On Monday, September 4, 2000, of Arlington, VA. Beloved husband of Greta Nilsson Masson; devoted father of Lisa Anne Masson of Annapolis, MD and Richard W. Masson, Jr. of Fairfax, VA; loving grandfather of Victor and Marshall Masson. Also surviving are his sister, Laurie Masson Masotti of Villanova, PA; two nieces and a nephew. Funeral services will be held at the Old Post Chapel at Fort Myer on Wednesday, September 13 at 9:45 a.m. Interment Arlington National Cemetery. In lieu of flowers, the family requests contributions be made to the Northern Virginia Hospice Fund, 5565 Arlington Blvd., Suite 500, Falls Church, VA 22042, in memory of Richard W. Masson Sr.